It is believed that the evangelist St. John had spent his last years in the region around Ephesus and was buried in the southern slope of Ayosolug Hill. Three hundred years after his death, a small chapel was constructed over the grave in the 4th century. The church was changed into a marvelous basilica during the region of Emperor Justinian (527 -565 AD). The monumental basilica was in the shape of a cross and was covered with six domes. Its construction, being of stone and brick, is an extremely rare find amongst the architecture of its time. Raised by two steps and covered with marble, the tomb of St John was under the central dome, that was once carried by the four columns at the corners. The columns in the courtyard reveal the monograms of Emperor Justinian and his wife Theodora. Constructed in the 5th century AD, the baptistery is north of the nave, with its key hole shape. Rampart walls around the church were constructed for protection from the Arabian attacts in the 7th-8th centuries AD. The impressive 10thcentury AD frescoes representing St John, Jesus and a Saint, ornament the chapel. 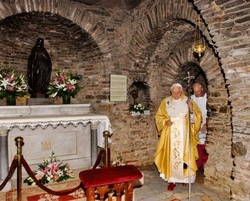 With the invasion of the Turks, the chapel was used as a mosque in the 14th century. Unfortunately the Basilica of Saint John became unusable due to a serious earthquake in the same century. The excavations around the Basilica of Saint John have been continuing under the supervision of Ekrem Akurgal since 1973, with the financial support of George B. Quatman. This church was built over the tomb of St. John. The presently-visible church is cruciform and roofed with six massive domes, and was donated by the Emperor Justinian and his wife Theodora. The capitals facing the nave (central aisle) bear their monograms.